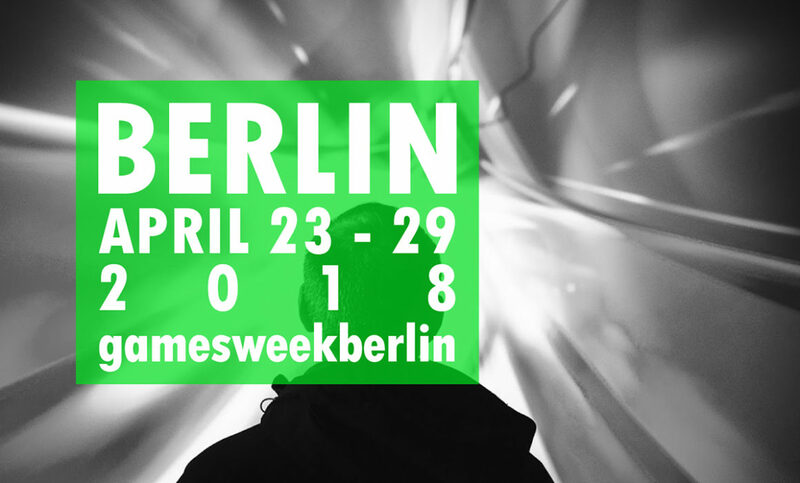 Berlin is set to become the capital of the games world: around 15,000 visitors are expected to attend #gamesweekberlin 2018 which will kick off next Monday (23 April) with the Opening Gala and the presentation of the newly created Medienpreis Games at Säälchen (Holzmarktstr. 25) in Berlin. Twelve individual events for both gaming enthusiasts and representatives of the games industry are gathered under the umbrella brand which combines different aspects, subjects and target groups of the sector. Berlin as the city with the highest concentration of games companies in Germany is the ideal venue for #gamesweekberlin. An indication of the popularity of games in Germany is shown by the most recent figures from game, the association of the German games industry: in 2017, the German games market posted growth of 15% to more than 3.3 billion Euros turnover and thus surpassed the 3 billion Euros mark for the first time. At today's press conference, the organisers and partners of #gamesweekberlin introduced the extensive and wide-ranging programme of the twelve events, presented the latest figures for the sector, and also launched the new English-language platform „Games Capital Berlin“ (www.gamescapitalberlin ) which will serve as an important information tool for the German and international games industry to provide information about Berlin in its role as a games hub. The Medienboard Berlin-Brandenburg supports #gamesweekberlin and several of its individual events. More information and tickets at www.#gamesweekberlin.com . To celebrate its 10th anniversary, A MAZE. / Berlin, is offering a unique games and playful media exhibition to those interested in games and art. There will be a presentation of a selection of 80+ independent and alternative games, VR installations and music performances – every evening from 20:00 as well as Sataurday and Sundays from 12:00 for the whole family. The event is supported by Medienboard Berlin-Brandenburg. The Seitenquiz is all about gaming knowledge. The participants in the #gamesweekberlin special event have a particular task. Three moderated rounds pose tricky questions about gaming to those in the know – supported by images, sound and video. The Gamefest is providing new and innovative games in an interactive exhibition with international blockbuster games, creative indie titles through to VR and board games. Heroes of the games world will appear on the Gamefest stage within the exhibition, with the programme also featuring influencers, music acts, live gaming / Let’s Plays, and much more. The Gamefest is being planned and realised in 2018 by Booster Space in coordination with the Computer Games Museum and with support from Medienboard Berlin-Brandenburg. The Wall 2061 is a city-wide live-action roleplaying game (LARP) where you arrive in the still divided city of Berlin. As a part of the resistance movement, you move through the city, gather information and speak with law-abiding and resistant citizens. The crowdfunding-financed game is open to beginners and experienced gamers. The Opening Gala and the presentation of the newly created MEDIENPREIS GAMES will open the #gamesweekberlin. There will be speeches by the Berlin Senator for Economics Ramona Pop, Bundestag deputy Martin Rabanus (SPD), Medienboard managing director Helge Jürgens, game managing director Felix Falk and Michael Liebe, CEO of Booster Space, among others. The Medienpreis Games sees itself as an instrument wanting to support German-language games journalism and recognise outstanding articles about computer games. The Opening Gala is organised by Freaks 4U Gaming and supported by Medienboard Berlin-Brandenburg. The Medienpreis Games has been devised as a collaboration between Booster Space, the journalist Matthias Huber (Süddeutsche Zeitung) and students of the University of Potsdam. Europe's longest running game developers conference QUO VADIS is the central event for the professionals. Leading international speakers are being lined up again over the course of two days at the STATION Berlin, including Dan Hay (Ubisoft Montreal/Canada), Kate Edwards (Geogrify, USA), Richard Garriott (Portalarium, USA), Tameem Antoniades (Ninja Theory, UK), and many more. Last year saw around 3,000 professional delegates attending. QUO VADIS is organised by CMG Conference, the event division of Computec Media Group, and supported by Medienboard Berlin-Brandenburg. Womenize! is the action programme for women in the games and tech sector for career building, empowering and initial and further training, and was extended this year to run for two days. Speakers include Kate Edwards (Geogrify, USA), Simay Dinc (founder of Women in Games Turkey), Sophia Ciocca (New York Times, USA), Anya Combs (Kickstarter, USA) Mona Mur (Terratols), and many more. Womenize! is also open to interested people of any gender. Womenize! is organised by Booster Space and supported by Medienboard Berlin-Brandenburg. The Unreal Fest Europe will give an insight into the latest trends in game development using the Unreal Engine of Epic Games. Engineers, programmers, developers and creators will be there to share their knowledge and experiences. The CEO and founder of Epic Games Tim Sweeney will attend in person to give the opening keynote speech. Other speakers are Matt Stoneham (Ninja Theory), Andy Bastable (Rare), Mike Gable (Epic Games), and many more. The games industry has been serving as a technology and innovation motor to drive developments forward in the IT sector for many years. The 2018 edition of the APITs Day of the „creative Applied Interactive Technologies (cAPITs)“ application centre enables companies to gather information about the potential for the application of technologies from the consumer electronics and games sectors in other contexts. The Matchmaking Dinner of games:net berlinbrandenburg is the 'by invitation only' communication and networking platform for VIPs from the games industry, the world of politics, and investors, with support from Medienboard Berlin-Brandenburg. A high point of the International Game and Playful Media Festival A MAZE./Berlin are the A MAZE. Awards which will be presented in six categories. In addition, the industry will be meeting for talks and workshops with such speakers as Adriaan de Jongh (The Netherlands), Bahiyya Khan (South Africa), Jack King-Spooner (UK), Hannah Nicklin (UK), Leena Kejriwal (India), Limpho Moeti (South Africa), Meg Jayanth (UK), Robert Yang (USA), and many more. The German Esports Summit is being presented for the first time as a central conference for organised eSport in Germany and will spotlight current challenges and central issues affecting eSports in its interdisciplinary programme in order to discuss them with representatives from organised eSport, sports associations, politicians, sponsors and the media. The German Esports Summit is organised by the ESBD – eSport-Bund Deutschland e.V. in cooperation with Freaks 4U Gaming, realised by Booster Space and supported by Medienboard Berlin-Brandenburg. The Alliance 90/Greens party will be opening the political dialogue at the Berlin Games Breakfast under the heading „Juicy spoils with loot boxes?“ and addressing the pressing issues of „video games“ as a cultural asset and media product. The event is divided into two sections – the workshop discussion and the exhibition. More information and tickets for #gamesweekberlin at www.gamesweekberlin.com .